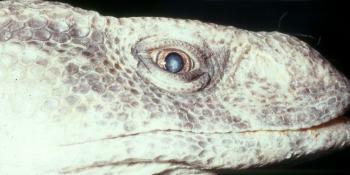 This monitor lizard is one of several showing these ocular signs. What is the lesion and what might be causing it? This animal has a cataract. 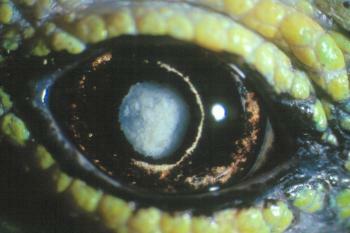 It lives under a fairly strong UV light sourcae as do many other reptiles, so this could be causing its lens opacities. On the other hand all this group of monitor lizards are pretty inbred, so maybe it has an inherited cataract. Here’s a green tree monitor lizard – a completel;y different species – but with a mature cataract. Perhaps diet could be a factor? It is very difficult to be sure, but important to find out in an endangered species where captive breeding might be a key to survival in the wild – without cataract! This entry was posted in Cases and tagged cataract, reptile. Bookmark the permalink.